To mark the 10th anniversary of the Australian Academy of Law (AAL), the 90th anniversary of The Australian Law Journal (ALJ), and the 30th anniversary of the Pearce Report on Australian Law Schools, the AAL and ALJ are presenting a national conference on the future of Australian legal education. 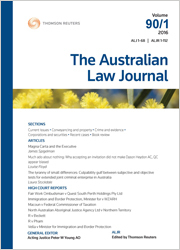 The conference is sponsored by the AAL and ALJ publisher Thomson Reuters, and is supported by the Law Council of Australia. The conference will provide a forum for an informed, national discussion on the future of legal study and practice in Australia, covering practitioners, academics, judges and, of course, students. Based on the presentations and discussion at the conference, the AAL will produce a national discussion paper on this important topic. The ALJ will also publish a number of the conference papers and the organisers are investigating subsequent publication of the papers. Bringing an international perspective, the keynote address will be delivered by Professor Martha C. Nussbaum, the Ernst Freund Distinguished Service Professor of Law and Ethics, appointed to the Law School and Philosophy Department, University of Chicago. Read more about Professor Nussbaum. There will be a session devoted specifically to the ongoing suitability of “the Priestley 11”. Pearce 30 years on — what’s worked, what hasn’t? What will legal education look like in the future? Curriculum — mandatory and elective subjects. What areas should be required for the right to practise? Is the Priestley 11 still fit for purpose? A law degree for those who do not intend to practise? Where’s the dividing line between academic preparation and practical training? The organisers invite short (not more than 300 words) abstracts of proposed papers. Please send to the Secretariat of the AAL, Ms Claire Hammerton, at Admin@academyoflaw.org.au by Friday 16 December 2016. Please also email your details to this address if you wish to be placed on the conference mailing list. Please see attached flyer for details here.